When I first saw this station on instagram, I knew I had to get there the next time I visited Copenhagen. Said and done, this was my first stop when I got back to Cph. I just love the symmetry and the beautiful window. I waited for a person to walk by and got lucky that this random woman decided to pass me with her bike. This awesome photo of the train station in Copenhagen will easily become one of your favorites. 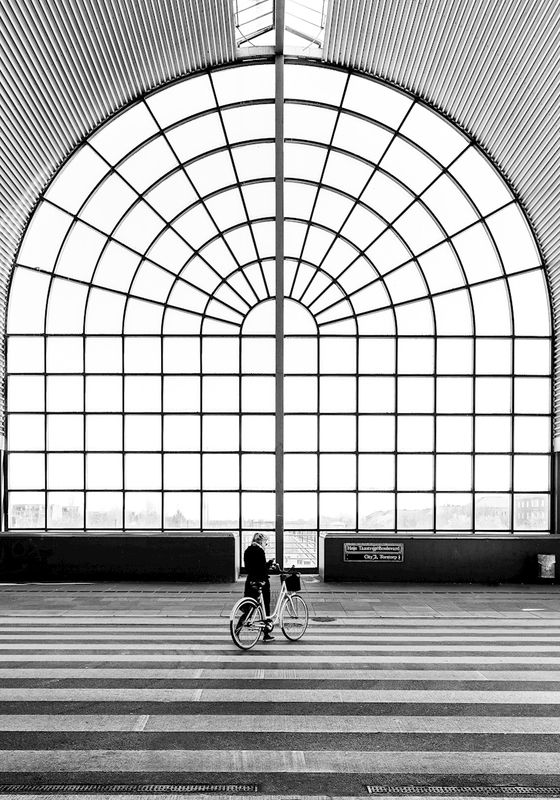 With contrasting shapes in the form of arched windows, zebra crossing and a cyclist that together create an interesting and cool interior detail. The black and white color scheme makes it easy to match with all types of photo art and art decor, and a perfect addition to any home.